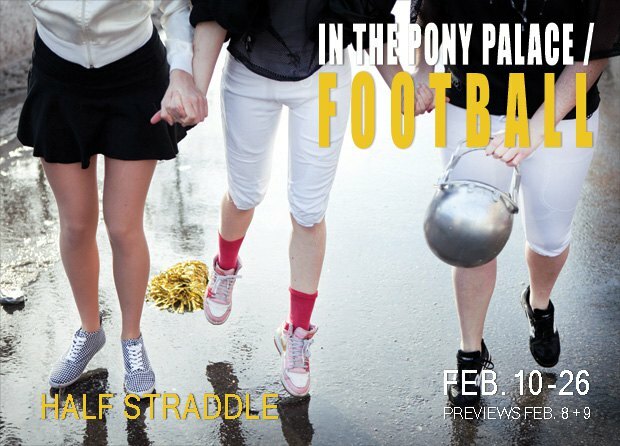 The theater company Half Straddle came up with a show called Pony Palace/Football, and it’s all high school, football and cheerleaders. But this isn’t Friday Night Lights: this is high school, football and cheerleaders, Bushwick style, and funny. At football practice, the players are rough: loyal to their sport, their coach and their stadium, the Pony Palace. They’re hitting on the cheerleaders. Everything is as you might expect, except that the players are all female. And the girls are pulling off this machismo in an exemplary way. The quarterback is tough chick, but she doubts her own leadership throughout the play. An overachieving newbie wants to replace the vulnerable QB. Another player is a tough cookie in the most adorable way when she’s hitting on a cheerleader. The two cheerleaders are simply awesome. They are all beautifully styled, with great dialogue between the cheers that ranges from complete silliness and shallowness to modern philosoph and Prozac-driven nonsense. The Coach and Maureen have their own power battle subplot that is also funny. You’ll fall in love with the team mascot when she takes off her Owl mask and begins her motivational speech. The only males you will see during the play are members of a marching band (marching band--perfection, right?! ), who throw in Lady Gaga tunes to liven up the scenes. Society may not be ready for them, but as a fashion addict, I am dying to wear the golden glittery jackets like the cheerleaders wear in the final scene. I should also stress that the football players and the cheerleaders are equally stylish. Check out the show soon, it closes February 26.